Dr. Paul Offit is a world-renowned expert on the safety and efficacy of vaccines. He has authored over 160 articles, co-invented the rotavirus vaccine, and been featured on shows like “60 Minutes,” “The Daily Show,” and “The Colbert Report,” among many others. In this segment, Sol Behar and Neda Frayha pick Dr. Offit’s brain about why our patients may be skeptical about vaccines and how best to communicate with them for the safety and wellbeing of all our patients. It is understandable that parents are questioning vaccines now given that they do not encounter the effects of these infections in their day to day life. The role of the clinician is to make the consequences of vaccine preventable diseases real for parents so that they can understand how truly scary they are. Why might parents be skeptical of vaccines? Parents are no longer scared of the diseases that vaccines aim to protect children from. In comparison to the twenties and thirties, when children were dying from diphtheria or becoming disabled from polio, this generation of parents have not seen firsthand the effects of these infections. As practitioners, we are asking parents to vaccinate their children against 14 different diseases in the first year of life to prevent diseases that most people do not see, using biological fluids that most people do not understand. With these facts in mind, Dr. Offit underscores is reasonable it is for parents to be skeptical. 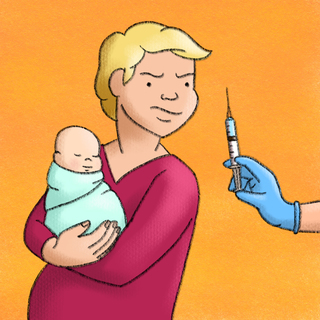 What can practitioners do when faced with a vaccine skeptical parent? The first thing to do when you see someone who is hesitant about vaccines is to ask them what they are scared of. If there is a specific issue, be it autism, diabetes or multiple sclerosis, there likely will be data to answer those questions. As the clinician, you try to present the data in a compelling, passionate, and compassionate way. As Dr. Offit says, science alone is not good enough. It is also important to make people realize that the choice not to vaccinate is not a risk free choice. By referring to parent activist groups like Families Fighting Flu or National Meningitis Association, you can provide parents with examples of the very serious risk associated with not vaccinating. What is Dr. Offit’s approach to dealing with a parent that is unsure about vaccines? The way that Dr. Offit goes about it is as follows: he finds out what the parent is worried about, tries to go through how one would answer those question, he talks about what has been done to answer those questions and ends by emphasizing why it is important to vaccinate. He makes it personal, making sure that the parent knows that he has his own children that are fully vaccinated and says that vaccinating is a matter of loving the child. He tells parents that by not vaccinating their child, the parent is asking him to practice substandard care. Why might parents continue to believe that autism is linked to the MMR vaccine? As Dr. Offit explains, if you are a parent of a child that suffers from autism, you want to try and figure out why. What Andrew Wakefield offered was a reason why; in his explanation it was the vaccine that caused the development of autism. With this explanation, parents were allowed some control over the disease. For example, parents believed that they could control whether or not their future children developed autism but choosing not to vaccinate them. As practitioners we can say things like vaccines are good and vaccine protect against preventable disease but what we still cannot say is what causes autism and parents want that explanation. How can practitioners advocate for their patients? Say something. It is important for clinicians to speak up when they see misinformation being presented because these false claims are devaluing the truth of science. A great question, where will the vaccine refusers go? If a practice can increase rates to 95% by threatening discharge of non vaccinators thats still 5-10% that go somewhere else. This also doesn't account for the parents who never even show up at your office because they know the policy ahead of time. So this then pushes the burden of vaccine refusal on to other practices, and in smaller communities this places an unfair burden on other practices in terms of quality measures, infection control etc. Another concern is if all of the board certified pediatricians and FP practices start to refuse to accept nonvaccinators, where will the children get other care? My concern is they will end up with naturopaths or other providers not really trained in well care of children. Hi Erica. Thanks so much for writing. This is an excellent question and an incredibly difficult dilemma. Sol and Dr. Offit and I talked about this a little in the segment, and as Dr. Offit said, it's an unanswerable question. Your concern is so valid. Of course we'll keep you and our listeners posted if we come across new data on this subject. How do you address those that don't have a specific fear, or are convinced that vaccines are a scam played by the drug companies on or with the government and/or on the people? Or do you not waste time on those so deep in conspiracy territory? Hi Margot. Dr. Offit wrote back in response to your question, and he and I are on the same page here... he says he generally doesn't try to engage with conspiracy theorists or disprove their ideas. He finds it's not always the best use of time. Hope this is helpful! Also, do you talk about this in front of the child, or with the child out of the room? I usually talk in front of the child, but have had situations where the 8 or 10 year old is convinced and wants to get vaccinated, but the parents still refuse. Hi again! Here's Dr. Offit's response: "I think it's reasonable to have the discussion in front of the child as long as the conversation remains civil." Thanks so much for writing in. Agreed. Particularly in family medicine, we will continue to take care of these kids once they enter adulthood. If we can get the kid on-board but the parents outright refuse, at least we can vaccinate them when they turn 18.